While I didn’t manage to get a picture, this is the kind of work my students are now doing to help them solve math problems — and they’re doing it independently. I always walk around — nervously biting my nails — during our seasonal rounds of standardized testing. I don’t know why, either. I work for a school system that truly values the learning process — a school system that trusts me, sees the whole child, and recognizes that a standardized test is just one measure of a child’s progress. And a rather flawed measure, at that. But still, my anxiety gets the best of me, and I hope and pray that the tests show at least a glimmer of what I’ve tried to convey to my students over the past months. Perhaps it’s just a little bit of my pride coming through, and perhaps there’s a small sense of satisfaction that comes from seeing the numbers go up. But it’s also that I want my kids to be able to show that they’ve succeeded; I want them to get credit for what they’ve done, even if it is on some silly test. And so I was walking around the other day, filing away at my nails with the corners of my teeth, watching as some of my students clicked through sets and sets of choices, one after the other, arhythmically and asynchronously. I saw wrong answers get washed away into their tests; I saw correct answers speed them along to even more difficult questions, and with every click my anticipation grew, waiting for the final three-digit score. 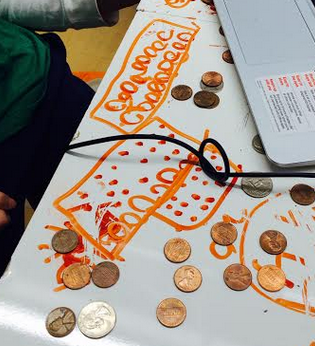 I approached one student, in particular, sitting at the end of a long table, a dry erase marker in his hand, using his end of the whiteboard table for scratch-work. Beneath him, he drew a series of dots in perfect little rows and columns, his brain conceptualizing a rather complex multiplication problem right in front of him. A sample from these dot methods being modeled earlier this year! I stopped in my tracks, and a bright smile came over my face. I ran to my co-teacher and gestured towards our student. I gestured towards him because I knew that she’d know why he was drawing the little rectangle of dots — and I knew she’d feel the same way. He was drawing the little rectangle of dots — not necessarily because he was going to get the question right, and not necessarily because he had mastered multi-digit multiplication. He was drawing the little rectangle of dots because he’d truly learned something with us. He learned how to conceptualize math, to draw a picture, to solve a problem — all on his own. And in that moment, I felt proud, regardless of the answer, because I knew we had made an impact that could not possibly be measured by a multiple-choice test. We’d changed the way his mind saw math, and that was enough progress for me. I didn’t even stay to watch if he answered it “correctly” on his computer screen. I simply walked back to my computer and sat down while he continued to work.